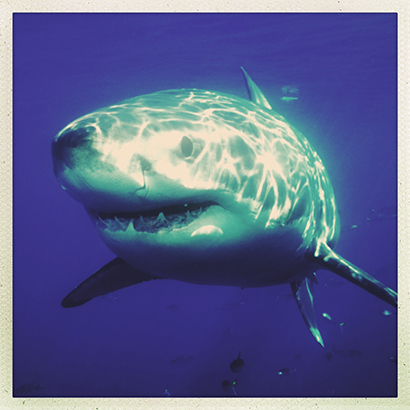 No fish commands such fear and awe, or is perhaps so misunderstood as the great white shark (Carcharodon carcharias). This is a truly massive fish – specimens approaching 20 feet in length have been reliably reported, while many believe the great white can grow significantly larger. They are found throughout the world – though require a water temperature in excess of 12 degrees Celsius – but despite being widespread rarely occur in significant number. In fact, they are widely protected, and as a greater understanding of the species is made, so the effect of overfishing and persecution becomes more evident. The only natural predator of a great white is the orca, and though Man will fish for him for food, he has more often hunted the shark for his own perceived protection. Let’s face it, a 20 foot shark can and will, on rare occasion, make a meal of a person. Yet the sensationalism spawned by panic or media representation is based on very few actual incidents. We actually make for a pretty worthless prey item, our bone mass being difficult to digest. Most ‘attacks’ are the result of shark having a ‘test bite’ – just to see what we’re made of. The problem being of course that a simple nibble can in itself be fatal. We should treasure this fish though. At 16 miilion years old they are a species that deserves our respect.